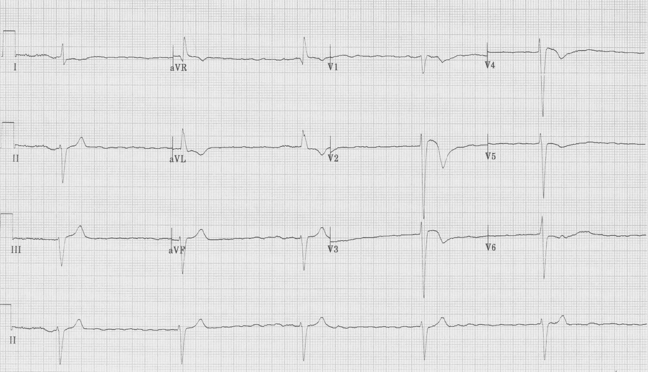 Second – the inferior leads keep catching my eye…no obvious ST-segment elevation, but the T waves look a bit prominent (hyperacute ? ), and then there is the T wave inversion in aVL (remember, reciprocal changes in aVL may be the earliest sign of an inferior MI). Now the inferior STEMI is evident! Note the rhythm change – now sinus at 100/minute, and with more prominent P waves. Not having been there, I can only guess – the original rate was likely due to excess vagal tone (common with inferior MI’s – think pale, diaphoretic, nauseous, bradycardic). The subsequent tachycardia might be due to nitroglycerin administration, or just less vagal tone, or maybe they received atropine. 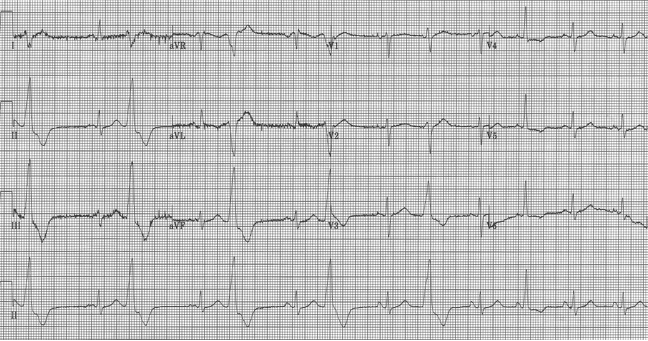 Elderly woman with generalized weakness x 2 days. 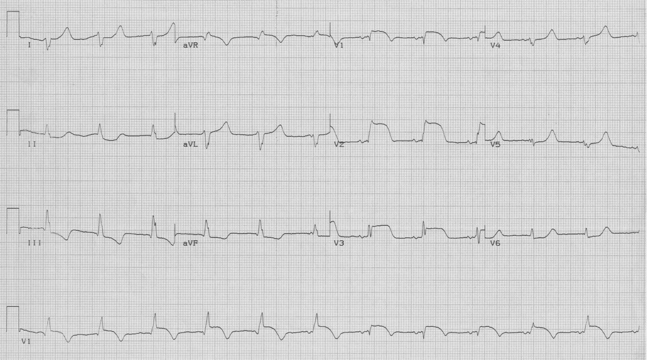 If this patient was taking digoxin it would certainly be important to check a level to rule out toxicity. 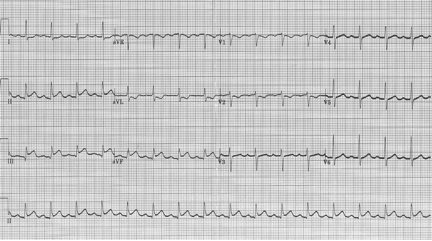 Digoxin toxicity classically causes two important EKG findings: 1) significant AV block (more than 1° AV block), and 2) increased automaticity (often accelerated junctional rhythm or atrial tachycardias). Typically these two EKG findings occur simultaneously – hence the classic dig toxic rhythms (PAT with block or “regularization” of the a fib due to 3° AV block with accelerated junctional escape rhythm). What looks like simple bigeminy is actually a slightly more interesting diagnosis. Again, calipers are very helpful! Notice that the ventricular complexes occur at a regular interval, and that the coupling interval (the space between the preceding QRS and the PVC) is not constant, as would happen with bigeminy. This rhythm is an independent ectopic ventricular rhythm, parasystole. Notice that the 6th complex is a fusion beat (a combination of the sinus beat and the ventricular beat) – a sure indicator of an independent ventricular rhythm. Traditionally parasystole is felt to represent a “protected” focus that is isolated from, and thus independent of, the electrical activity of the surrounding myocardium. Parasystole is of no greater clinical import than PVCs of similar frequency or even bigeminy. 45-year-old man with 2 hours of chest pain and diaphoresis. (Pay special attention to the rhythm strip). Looking at the V1 rhythm strip, the first five beats are an accelerated idioventricular rhythm (no P waves, wide complex, and regular rate of 70/minute). Just before the 6th beat you can see the “emergence” of a P wave – this particular P wave is very close to the subsequent QRS, and there is slight variation in the QRS morphology. The 6th QRS represents a fusion beat (a composite between the ventricular beat and a sinus-conducted beat occurring at nearly the same time). The 7th through 9th beats appropriately follow P waves and represent sinus conducted beats. This rhythm represents isorhythmic competition between accelerated idioventricular beats and sinus beats occurring at nearly the same rate. 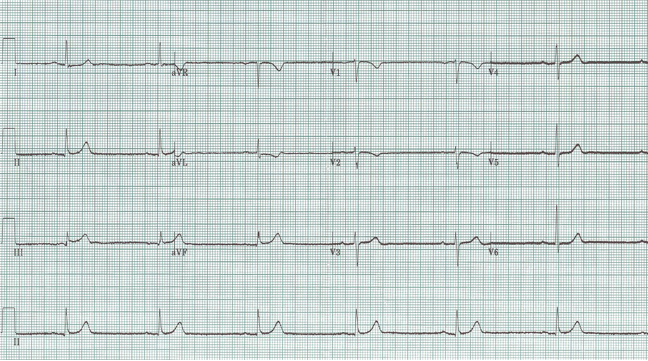 The reason for this rhythm in this patient is apparent from leads V1-3 (the sinus conducted beats, so they can be interpreted) – the patient is having an acute anterior MI. Periods of accelerated idioventricular rhythm are common during acute infarction and especially during reperfusion following thrombolysis. AIVR has also been termed nonparoxysmal ventricular tachycardia or “slow v. tach”. It usually does not produce any hemodynamic change, and requires no specific treatment.